The best Scotty Cameron Putter...? Find out which it REALLY is by reading genuine, hands-on reviews! Which is the best Scotty Cameron putter to go for? Which is the best Scotty Cameron putter? They come in all shapes and sizes, but what do they feel like to use and how do they roll the ball? Our hands-on reviews will tell you! Also find out where to buy them at the best prices! Scotty Camerons represent the gold standard against which all other putters are judged. Each week dozens of players on all of the world's professional tours use a Scotty Cameron because they trust the precision with which the company manufactures its models and the super responsive feedback you get from a Cameron putter. Scotty Camerons are amongst the most expensive putters around. Some pre-owned models sell for $300+, and you can double that for limited edition models. Click on the links below to find out which model is the best for you with www.Best-Putter.com's independent, hands-on reviews, you'll also find where to buy them at the best prices! Are Scotty Cameron Putters the best in the world? Players using a Scotty Cameron have won a staggering 1/3 of all major championships since their first major victory in 1993 when Bernhard Langer won the Masters with a Cameron prototype. Tiger Woods' putter for all of his Major victories up to 2010 was a custom built putter based on the Ping Anser 2 design. Rumour has it that he has always used exactly the same putter (with the exception of the 2010 Open at St. Andrews) that was first made for him in July 1999, despite the company making 3 to 4 reserves each year. Scotty Cameron putters are second only to Odyssey putters in terms of tour usage, and they are beautiful pieces of kit with which to ply your trade on the greens. They roll the ball like magic and everything about them has "hand made" feel (even though they're actually machined). 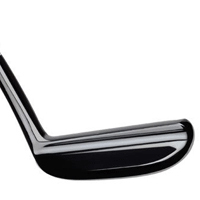 They are routinely the most expensive mass produced putters on the market and their early models are highly collectible often commanding high prices in the used putter market. Sales well in excess of $500 are not unheard of. Cameron putters have led the way in introducing customization to the putting market. Using their service (somewhat pricey, it must be said), you can change all the essentials like grip, head weight, loft and lie. But it's not just about the playing characteristics of your putter. The Custom Shop will "Pimp Your Putter" in any way you like. Simply send your putter to them you can add colour, your name, extra sight lines or dots... just about anything you fancy. Turnaround time is approximately 3 weeks. Not sure if a Scotty Cameron putter is right for you? Click here for our guide to choosing the right putter for your stroke.